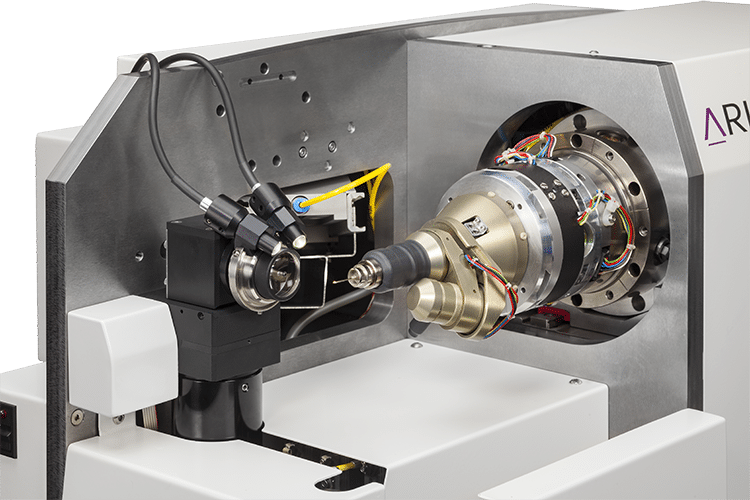 The OAV Ultra-Zoom (On-Axis Video-microscope) is designed for the parallax free observation of micrometer sized single crystals. 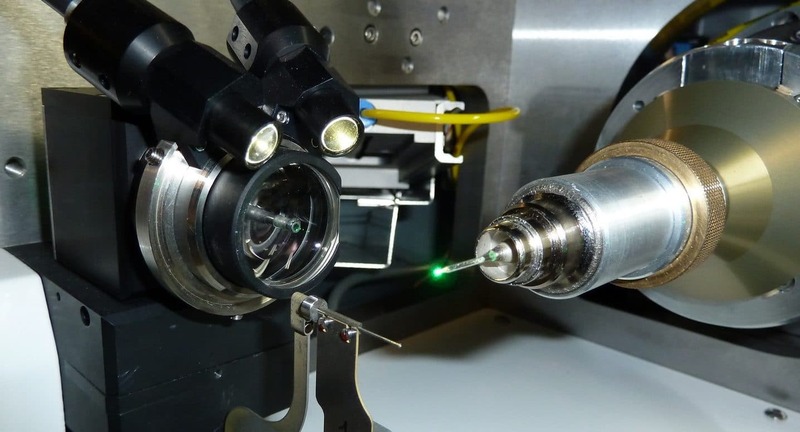 The OAV Ultra-Zoom is a powerful tool for the alignment of crystals with respect to the X-ray beam on MX beamlines. It is integrated into all Arinax diffractometers (MD2-S & MD3) as a standard sub-assembly. The X-ray beam passes through the objective’s lens system by means of a central hole which is coaxial with the optical axis. 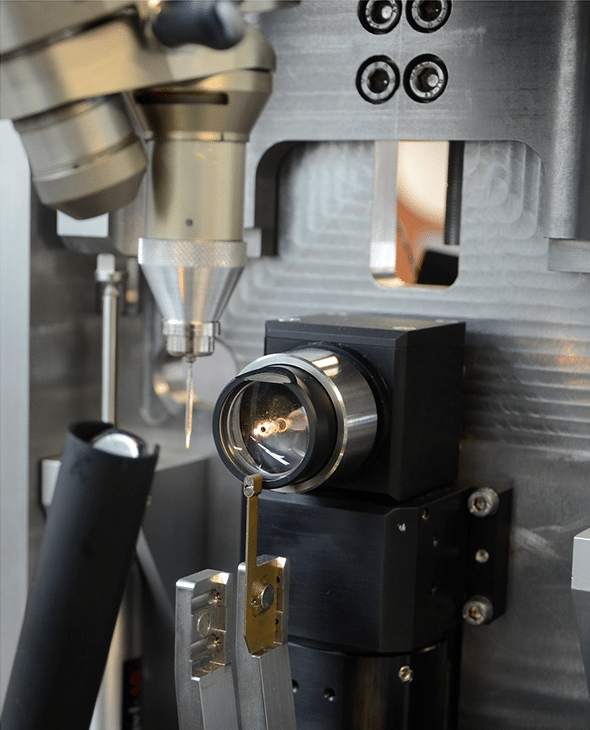 This coaxial video microscope provides a parallax free sample visualization that allows in situ perfect alignment of the sample. This unique design is developed by the EMBL Grenoble Instrumentation Group (Cipriani team). The OAV Ultra-Zoom is composed of a high resolution drilled objective giving x3 to x30 magnification, a numerical aperture of 0.28 and a working distance of 31.8 mm; it is combined with a high performance zoom and a digital camera which enables a resolution of 659 x 493 px (standard CCD) or 1360 x 1024 px (optional CCD). The integration of these elements provides excellent optical performance, with a resolution of 0.35 µm/px (standard CCD) or 0.16 µm/px (optional CCD). Consequently, the OAV allows distinguishing objects as small as 1 µm. Thanks to the integrated polarizer, the OAV Ultra-Zoom can condense the light produced by LED and conveyed by fiber optic, so the OAV works perfectly with the Luciole Cold Light Source developed by Arinax. The OAV takes all the advantages of the 3 fiber optic output channels available with the Luciole CLS: it provides a dual frontlight of maximal 2 x 1050 Lm and a backlight of maximal 1050 Lm without heat emission (LED illumination).